And there was end of journey. When they code in fork/PR , I will close my eyes on other coding stuff and try it again because Gitlab is not close to my heart and installing their binary takes ~850MB of space which means a lot of ruby code that could go wrong way. It would be really awesome to have in archive something to apt install and have github-like place. It would be great if Debian infrastructure would have the possibility to have that. Although I am thrilled about it finally reaching Debian archive, it still isn't ready. Not even closely. I couldn't even finish installation of it and it's not suitable for main archive as it takes files from github repo of diaspora. Maybe poking around Bitnami folks about how they did it. Text Secure is was an mobile app that I thought it could take on Viber or WhatsUp. Besides all its goodies it had chance to send encrypted SMS to other TS users. Not anymore. Fortunate, there is a fork called SMSSecure which still has that ability. So there is this Allwinner company that does crap after crap. Their latest will reach wider audience and I hope it gets resolved in a matter how they would react if some big proprietary company was stealing their code. It seems Allwinner is a pseudo for Alllooser. Whoa, that was fun! So I had a bet with a friend that I will run for a year Debian Unstable mixed with some packages from experimental and do some random testings on packages of interest to them. Also I promised to update aggressively so it was to be twice a day. This was my only machine so the bet was really good as it by theory could break very often. 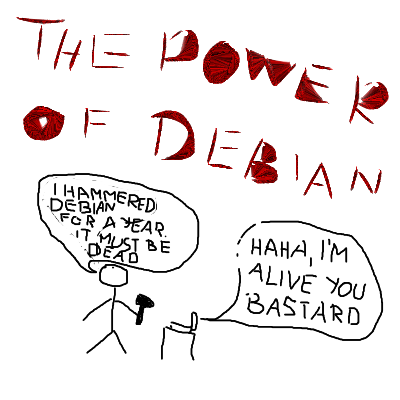 Well on behalf of Debian community, I can say that Debian hasn't had a single big breakage. Yay! The good side: on average I had ~3000 packages installed (they were in range from 2500-3500). I had for example xmonad, e17, gnome, cinnamon, xfce, systemd from experimental, kernels from experimental, nginx, apache, a lot of heavy packages, mixed packages from pip, npm, gems etc. So that makes it even more incredible that it stayed stable. There is no bigger kudos to people working on Debian, then when some sadist tries countless of ways to break it and Debian is just keeps running. I mean, I was doing my $PAID_WORK on this machine! The bad side: there were small breakages. It's seems that polkit and systemd- side of gnome were going through a lot of changes because sometimes system would ask password for every action (logout, suspend, poweroff, connect to network etc), audio would work and would not work, would often by itself just mute sound on every play or it would take it to 100% (which would blow my head when I had earplugs), bluetooth is almost de facto not working in gnome (my bluetooth mice worked without single problem in lenny, squeeze, in wheezy it maybe had once or twice a problem, but in this year long test it's almost useless). System would also have random hangs from time to time. The test: in the beginning my radeon card was too new and it was not supported by FLOSS driver so I ended up using fglrx which caused me a lot of annoyance (no brightness control, flickering of screen) but once FLOSS driver got support I was on it, and it performed more fluid (no glitches while moving windows). So as my friends knew that I have radeon and they want to play games on their machines (I play my Steam games on FLOSS driver) they set me the task to try fglrx driver every now end then. End result - there is no stable fglrx driver for almost a year, it breaks graphical interface so I didn't even log into DE with it for at least 8 months if not more. On the good side my expeditions in flgrx where quick - install it, boot into disaster, remove it, boot into freedom. Downside seems to be that removing fglrx driver, leaves a lot of its own crap on system (I may be mistaking but it seems I am not).